Ben is for Peace - Benjamin T Brixey "A Libertarian perspective"
In order to better understand the Middle East we need to better understand our own history. History is one of my passions and I have spent a great deal of my life using it to understand the problems we face in the Middle East. We do not need to take the time to learn about religious history which stretches back for thousands of years. Instead we need to understand the more recent and very specific historical events that have formed the Middle East. First, we will discuss the Ottoman Empire which was the empire that ruled the Middle East for over 600 years, from 1299-1923. Second, we will see what happened to the Middle East after World War I through the British Mandate System. This system created countries where there was no organic country to be made. Finally, we will dive deeper into America's involvement in the Middle East and its continuation of the British problem. 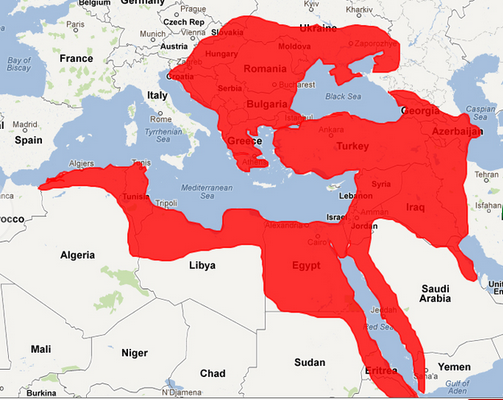 The Ottoman Empire is considered a Turkish and Islamic empire that actually was very close to sweeping across Europe. The Ottoman Empire started out as a small group of warriors and quickly expanded to supremacy. Ruling over a huge chunk of the world without interruption for over 600 years. The borders were vast including modern day Iraq, Syria, Israel, Egypt, parts of Saudi Arabia, Turkey, Greece, Bulgaria and northern Africa. The main city was Istanbul and this was formerly known as Constantinople. The Ottoman armies were very advanced and expressed themselves in Eastern Europe. Knocking on the doors of the Austrian Empire in Vienna during the siege of Vienna,1683. It pushed its borders further east and held its line against the Persian Empire, or modern day Iran. The nature of this empire was more liberal than any empire in the world at the time. While Christians were purging religions out of the their borders. While China kept professing the male dominated Confucianism. The Ottomans only forced people who were not Muslim to pay an extra tax called Jizya. The other religions were able to practice their religions and use their own religious courts, or the Islamic courts. Jews, Christians, Muslims and Zoroastrianists lived in relative peace for over 600 years. Why are they all of a sudden at odds? The reason for this freedom has to do with the number of true Ottoman's there were. The Ottoman Empire was run by only a few guys and in order to keep the status as sultan the empire would have to stick together. The way to keep the Empire from falling apart was to actually let people live their own lives. So what happened? The British Mandate System After World War I and Colonialism.